Timex are, of course, a well-known manufacture of watches but less well-known as makers of heart rate monitors. Having said that, they produce a good range of heart rate monitor watches. 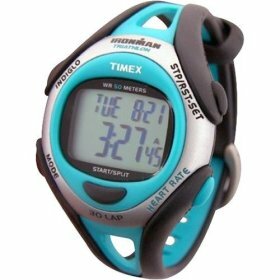 There are Timex heart monitor watches with the most simple basic heart monitor functionality (which may be just what you need) right up to those with the most sophisticated features such as downloadable software packages and GPS (global positioning system to measure speed and distance via satellite). Many of these heart monitor watches pack in so much more functionality than a standard Timex sport watch and often at little more (if any) additional cost. You can buy a Timex heart monitor watch for well under $100 on Amazon although more sophisticated models can cost $300 or more. Timex introduced the Ironman Triathlon as far back as 1986 – the first multi-function, performance sport watch. Due to its comprehensive athletic timing features and new look, the Timex Ironman heart monitor quickly became the best-selling sports watch in the world. In fact this Timex heart rate watch was marketed as a triathlon heart rate monitor though of course it had and has plenty of users among serious and casual exercisers of all types. Now many of the features in the original Ironman digital heart rate monitor have become common place in other sports watches and digital heart monitors. Timex have retained the Ironman branding and continue to develop their range to add more features with varying rates of success compared to better known brands (at least as far as the heart rate monitor world is concerned) such as Polar. One advantage over Polar and some other heart rate monitors, is that all Timex Heart Rate Monitors have batteries that can be replaced by consumers without requiring them to be returned to the manufacturer. Problems with Timex Heart Rate Monitors? A number of problems with accuracy are showing up in consumer reviews for more sophisticated Ironman and Bodylink models. This seems to be particularly the case with the GPS (Global positioning system) technology which seems to work accurately only in certain conditions. The fact there are known problems with GPS heart rate monitor watches from other manufacturers too. GPS is known to work less effectively if you exercise in areas where the signal will be poor (in particular through streets with tall buildings and under dense foliage). Naturally users seem to either love their Timex GPS or hate it depending on whether it happens to work in their environment. If GPS functionality is important to you, check out the reviews and make sure that it will work where you plan to work out. You might expect the Timex website to give full information about their range of heart rate watches but I found that this was far from the case and could not find what I was looking for – information about the latest models. Better information is found on some of the well-known shopping sites such as Amazon where you can click the link see the range of timex heart rate monitor watches.